Mineral Fusion's Smoothing Hair Oil Mist is meant to be a lightweight smoothing mist to tame flyaways, smooth hair and provide luxurious hydration. How? It smooths hair with lightweight Argan oil and coconut oils that add hydration to hair and that smooth hair. Organic jojoba oil and sunflower oil seal hair the hair cuticle to tame flyaways. The essential mineral blend plus sea kelp addition help prevent breakage and restore hair heal and shine, and provide luxurious hydration to hair. This formula is pure, safe for color treated hair, is 100% vegetarian and is paraben-free, sulfate-free and gluten-free. It is enriched with natural keratin to help keep hair looking smooth and soft, yet have a lot of natural volume. The best way to use it is to spray onto damp or dry hair and to lightly comb through hair to distribute throughout hair. You should immediately notice how much softer and smoother your hair is after using this product, I did. I felt like my hair was shinier and definitely more hydrated. 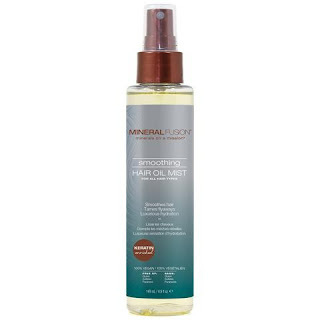 I think this Smoothing Hair Oil Mist is worth using and is a great product to try out and use. Mineral Fusion only puts out the best products. You will also love the smell of this, it smells like candy in summer. 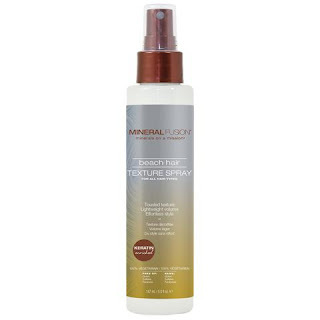 Mineral Fusion's Beach Hair Texture Spray helps to provide the look like you just came back from the beach. With effortless style, you can have beach hair in an instant. Instant natural volume with hair health. Apply to hair for tousled, beachy texture and effortless style. Biotin and vegetarian Keratin help build fullness and create natural volume in the hair. Their essential mineral blend plus lavender promotes hair health. The formula is safe for color treated hair, is 100% vegetarian and is paraben-free. The best way to use this is to lightly mist on to damp or dry hair to add texture and volume. This is for days when your hair is not cooperating and you need a little push. Spray all over and then crunch your hair up and around. You will be amazed at the results. It will be like you have been to the beach. I think this is one of the better beach texture sprays. It seems to work better on my hair than most of the other ones do. I like to have tousled hair and it is easy to achieve with this spray. 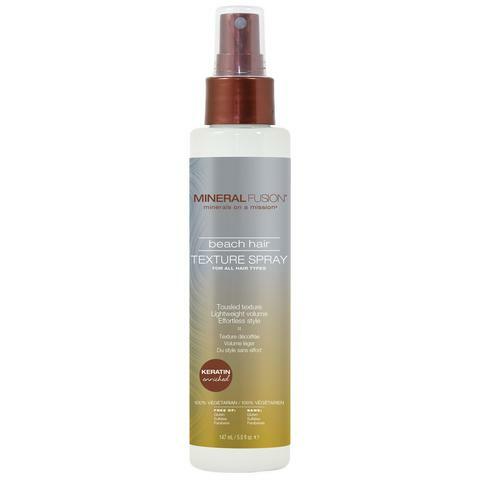 Mineral Fusion can be found online at www.mineralfusion.com and at various stores. Here is the store locator: www.mineralfusion.com/apps/store-locator. Like Mineral Fusion on Facebook: https://www.facebook.com/mineralfusion; Follow Mineral Fusion on Twitter: @mineralfusion; Follow Mineral Fusion on Pinterest: http://www.pinterest.com/mineralfusion/ and Subscribe to Mineral Fusion on YouTube: https://www.youtube.com/user/mineralfusion.